Thanks to a strain in his rib cage it appears that the Brewers slightly used closer, Trevor Hoffman, will not be available to start the season. This of course kicks speculation about the next in line into overdrive. A serious oblique injury (and it appears that Hoffman's is serious) can take four to six weeks or more to heal properly. The wise money should be on the 41-year old coming in on the long side of that healing time. "It's looking dim," manager Ken Macha said. Macha made that pronouncement after head athletic trainer Roger Caplinger told him that Hoffman won't be back on a mound for another week or so. 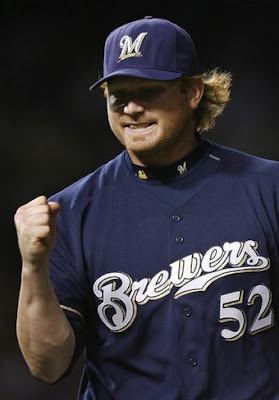 Because he would probably need to work a few side sessions before getting into a game, it's increasingly likely that Hoffman will be sidelined, and perhaps on the disabled list, when the Brewers play their regular-season opener on April 7 in San Francisco. Ken Macha seems to prefer right-hander Seth McClung as the temporary replacement. McClung has improved significantly since joining the Brewers and has the stuff to close. Many fantasy analysts have projected Carlos Villanueva as the next in line to close. Villanueva showcased awesome skills as the 2008 season came to an end and many expect him to breakout this season. Unfortunately, Villanueva has pitched poorly in camp, bad enough for Macha to announce publically that he has been disappointing thus far.